SHARMINI PERIES, TRNN: Welcome to the Real News Network. I’m Sharmini Peries coming to you from Baltimore. Several major politicians in Europe have announced this week that negotiations for the Trans-Atlantic Trade and Investment Partnership, TTIP, have collapsed. Germany’s Vice-Chancellor and Economics Minister, Sigmar Gabriel said and I quote, “In my opinion, the negotiations with the United States have de facto failed, even though nobody is really admitting it.” Similarly, France’s President Francois Hollande said something similar. Let’s take a look. FRANCOIS HOLLANDE: The negotiations are bogged down, positions have not been respected, it’s clearly unbalanced, so what is best is that we come to a clear realization and that rather than prolonging talks, which on its basis can’t have an outcome – it is better to make sure that we can advise all parties that France will not be able to agree on an accord which has been prepared that way without the indispensable basis for a positive conclusion. PERIES: Critics of the TTIP have long argued that the deal would undermine national sovereignty and give corporations the ability to sue governments for imposing environmental or workplace regulations that would harm their profitability. Joining us from London, to take a closer look at what has happened with the TTIP negotiations, is Nick Dearden. Nick is the director of Global Justice Now, a UK-based social justice organization that has been organizing against the TTIP. Thanks for being on The Real News, Nick. NICK DEARDEN: Thanks for inviting me. PERIES: So Nick after 3 years of negotiations of TTIP, 27 chapters of discussion have all come in vein and apparently the TTIP has failed. Do you buy that? DEARDEN: I think what’s happened is the sheer outpouring of public anxiety, concern, and anger from across Europe and the United States on TTIP has meant that they simply can’t continue. And what they’ve been forced to do because what they see now is that the anger over TTIP and the anti-TTIP campaign are threatening the entire agenda of what they call free trade agreements. There are several other free trade agreements that they’re also trying to negotiate at the moment. So by taking away the most controversial of them by sacrificing that one if you like, they’re hoping that they may still get some remnant of this enormous what we call a corporate offensive, corporate takeover plan through the European parliament. So as we see it, it is something to be celebrated. It’s a great victory. We never thought that 3 years ago when nobody had really heard of TTIP, we never thought that we would be here in 3 years’ time celebrating its demise. I think we are and I think that’s a good thing. So we’re going to celebrate that. But at the same time it’s not quite time to put our placards and campaign cards away. There’s a big fight still to be had. PERIES: Right and Global Justice Now and Green Peace who carried out a very effective campaign, first I should congratulate you guys for this and second I also know that the secrecy with which the TTIP was negotiated with was effectively countered by Green Peace when they managed to access a draft of the treaty that was in negotiation and they actually projected it onto the parliament building with the faces of all the people that were a part of the negotiations and discussions from the corporate sector. So that everybody came to know and the profile was high which I’m sure gave way to defeating it at least in the way they’re articulating now. And surely it should be celebrated. However, as you said there’s some other agreements in the works that should also concern us. So tell us about them. DEARDEN: Yes. Really this project of they call them trade deals but its not really much about us selling coffee and you selling clothes or something like that. It’s not really what most people think about others as trade. Really what it’s about is rewriting the rules of the global economy to suit big business, big corporations. And that’s a direct threat to our public services, our environmental regulation, our public, our ability to protect the more vulnerable in our society, our democracy as a whole. And there were 4 components. One was TTIP, the most controversial. The other which is better known in North America is the TPP, the Trans Pacific Partnership. But there’s also two others. CETA which is a Canadian EU deal which is at a critical stage of negotiations. They’re hoping to ratify that within the next twelve months and that’s the one that they’re really worried about. And the TSA, the Trade and Services Agreement, which covers all services from finance through telecommunications, postal service, transportation, right through to health and education. So massive super privatization, super liberalization treaty which has about 50 countries involved in it. And they’re particularly concerned about CETA. CETA just hasn’t attracted the same amount of opposition here as TTIP has. I think that’s largely because people view Canada as a society and economy slightly more like Europe than the United States is so they’re less worried. The case we’ve made is this isn’t about whether we want to be more like Canadians or more like Americans. This is about big business getting its way and people losing their control of their society. So that’s the case we’ve got to make now with CETA. They thought CETA was safe. But was starting to happen within the last 2 months, 3 months, was that the anti-TTIP campaign was actually starting to drag CETA down with it as well because as we said this really is TTIP by the backdoor. If you’re worried about big business suing our government for introducing regulations that protect the environment, that protect our society, or that they were democratically elected to carry out then exactly the same thing will happen under CETA. Canadian multinationals will be able to do the same thing but also American multinationals would have subsidiaries in Canada and that’s tens of thousands of corporate entities who will also be able to take those kinds of actions. So CETA itself was starting to be a contested territory and every week you saw a new parliament or a new government minister somewhere in Europe saying we’re not so sure about this. So they were really worried. So what they’re hoping is by taking this tactical retreat from TTIP they will be able to get CETA through by the end of the year or by next year and it’s our job to make sure they don’t. PERIES: Nick the level of sophisticated resistance that the Global Justice Now and the Green Peace in Europe has managed to amount TTIP, do you think you’ll be able to sustain this kind of resistance and energy for the other trade deals that’s coming? DEARDEN: I think it will be. I think this is just too big a movement now to suddenly collapse because we’ve won on one front. This is one of the biggest movements in European history. I mean over 3 million people signed a petition in just a 12-month period saying we don’t like TTIP and we don’t like CETA. That was a part of it. There are hundreds, thousands actually of local authorities, municipal governments right across Europe that have declared themselves TTIP and CETA free zones. So I don’t think this is going away. There are networks of people who care about food, student networks, and so on. All opposed to TTIP and that’s going to have an effect on CETA too. Because you see the reason there was so much opposition around TTIP wasn’t just because it was a trade deal that we didn’t think we were going to do well out of. It was fundamental symbol of how a whole economy has been geared up to meeting corporate interest, to making corporate profits above everything else. And the so called rights of corporations to go wherever they want and do what they want and invest however they want, that’s common in our economy to trump human rights. The right to a decent dignified life with housing or all the other things that you need. And I think TTIP was simply a symbol of that that appeared at the right time. And our job now is to make sure that people aren’t hoodwinked into going home and thinking everything’s okay then we stop that trade deal but then to actually go on to stop these other trade deals and to do more than that. To start thinking again about how we can build an economy that really is controlled by ordinary citizens and benefits ordinary citizens and creates more equality, creates more climate friendly form of industry and so on. PERIES: Now Nick there’s a very interesting development here in the US and that is the Democratic Party’s president, President Obama wants to fast track TPP and get it through before he leaves office. Now this week we’ve had some bi-elections in the United States and a number of people that support the fast track has been reelected to govern here. 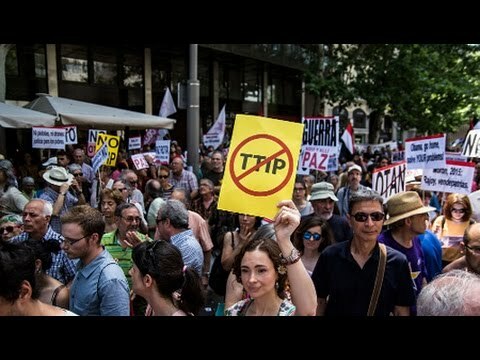 Do you think that has any significance in terms of the kind of resistance and the people can mount against TPP as you have done in Europe? DEARDEN: Well look I mean I wouldn’t for a moment imagine that every parliamentarian that we’ve got even on the social democratic side is up in arms about TTIP. I mean it has been a tremendous piece of work to try to convince the majority of MP’s representing the Labor Party our official opposition, that TTIP’s a bad thing. That’s not how it started and there are many people still in the Labor Party who are elected representatives who still don’t think it’s a bad thing. So you know there’s probably not as much difference as you imagine there. The thing that really struck me and I think it’s also had a feedback mechanism here in Europe is the way that in the primaries in the US before the presidential election, trade became an enormous issue whereby ordinary people said that for the first time that I can remember, these deals that you’ve done don’t represent our interests. They’ve impoverished certain parts of our country, inequality’s grown. You know there’s a real concern among American workers in the same way that I think there is amongst workers in Europe that these trade deals are done in the interests of a very small section of society. And the way that came through in the primaries was made a huge difference. Because all of a sudden, European politicians who wanted this were looking across the Atlantic and saying well are we going to be able to get this through even if we can pass it through the European parliament will it pass through the United States president and congress? And so that’s been really big. And I know that Hillary Clinton is by nature a free trader and likes these kind of deals. But I mean the fact that even she’s been forced to backtrack on TTIP and on TPP I think is really significant and I think what it suggests is that we’re coming to an end of the era of what we call neoliberalism or this phase of highly financialized capitalism which has created so many social and environmental and economic problems and we need to look for an alternative. Now the problem for those of us who are on the left of the political spectrum is creating an alternative that resonates with ordinary people because if we don’t do that it isn’t going to be more of the same. It isn’t going to be more trade agreements like TTIP. It’s going to be the kind of economic nationalism that Donald Trump represents and the far right across Europe represents. They’ve jumped on the anti-TTIP bandwagon as well and they’re putting forward a set of policies which are absolutely anathema to the kind of better world we want to build. So the [inaud.] is on us now. Not just to oppose and defeat these things but actually to start creating a more democratic economy and society. And there are examples of that going on all over the place. You know people reclaiming their food system from big agro business and people starting up socially minded banks and trying to take back energy companies into public ownership and running it on a fairer and more sustainable basis. This is happening all over the place but it needs to be connected up into a bigger program that resonates with huge numbers of people in our society who feel quite rightly marginalized by the economy that we’ve been living under for the last f40 years. PERIES: Alright Nick. Very informative and again congratulations and we look forward to hearing from you again.